Scallop Pearl -- Ever Find One? 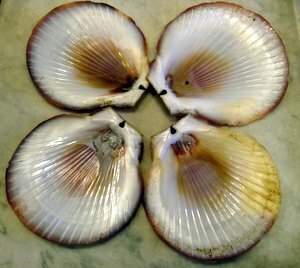 Scallop Pearl -- Ever Found One? Yes, a scallop pearl can be found. I love hearing from folks who find these. These shell shapes are an often used symbol and are included on many coat-of-arms, including Winston Churchill's. They live in all of the world's oceans and include more than 350 species. Unlike some other mollusks, these are excellent swimmers and are in fact the only migratory bivalve. These pearls are often small, but can be plentiful. I invite you to share your story of finding these pearls. Be sure to include a photo or video. Have You Found Natural Scallop Pearls? 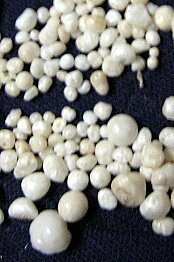 Do you have a great story about finding natural scallop pearls? Share it! largest scallop pearl I have ever heard of. Winter 2012 working on scallop boat finding about 1,500 Maine scallop pearls a day. Scallop Pearl at Fine Dining Restaurant in Washington D.C.
Go to main finding a pearl page after scallop pearls.